LA-250 Series - High power Coaxial Super Dispersion 4-Way Speaker. This unit offers smooth response and excellent off-axis dispersion, which limits the need for equalization and processing equipment. It also features a long-throw polycone and inverted rubber surround which can eliminate the need for sub-woofers in applications where low bass is required. 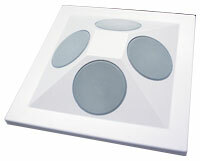 A 1/2" dome tweeter mounted on a post provides very uniform coverage. Ideal choice in a wide variety of commercial installations including digital jukebox locations, auditoriums, lobbies, etc. Nominal Magnet weight : 19.4 oz.